Since arriving in Korea, I have become addicted to green tea. In addition to its medicinal benefits (gotta love those antioxidants), it is also comforting and provides just the right amount of caffeine to start off the day. It has also found its way into my daily skincare regimen and various cosmetics and toiletries that I use. 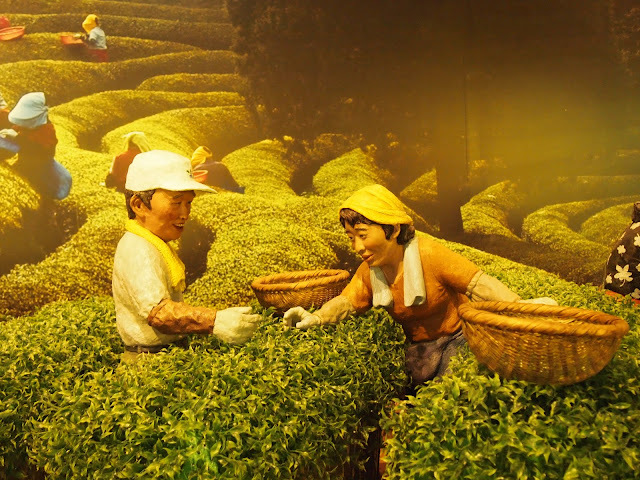 Green tea is extremely popular here in Korea and a big portion of it is grown and processed in Boseong, a quiet little city in southern Jeollanam province. After seeing pictures of the green tea fields during spring the previous year, I knew it would be the perfect destination to relax and show my mom, who was visiting Seoul at the time, the beauty of the countryside. After arriving at our destination via a KTX ride to Gwangju and a bus trip to Boseong Station, we were able to hail a taxi to our pension. After heading out of the city and up a twisting steep road, we were greeted hospitably at Golmangtae, one of the more interesting lodgings I've stayed at during my travels. 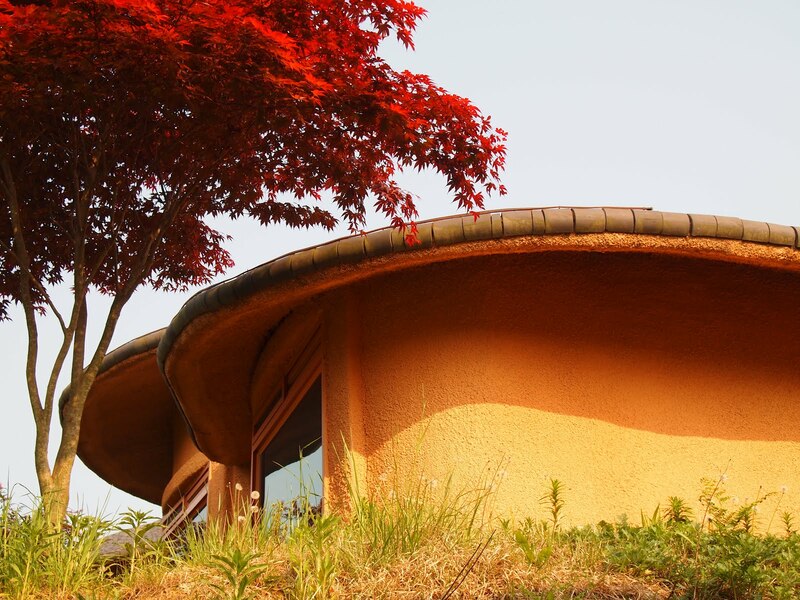 Rooms here are housed in mushroom-like buildings made from loess, a mixture of clay, sand, and silt. The interior of our toadstool was very basic but the big window provided a view that would have made the Smurfs envious. (They lived in a mushroom, too, right??) We soon realized we wouldn't be going anywhere that night as we were out in the middle of nowhere and transportation was nonexistent. So, we checked out the on-site tearoom set into a cave where the owner also makes various green tea based products. We turned in early to get a good rest for the next day. Our toadstool room at Golmangtae pension. The owner of the pension was kind enough to drive us out to the Korea Tea Museum, located in a nice building not far from the plantations. I didn't expect much but was pleasantly surprised to see interesting, aesthetic exhibits focused on various aspects of tea culture in Korea. Hanji (Korean paper) dolls depicted life working in the tea fields, videos showed the beautiful ritual of the Korean tea ceremony, and exquisite tea cups from various time periods exhibited the importance of tea over the years. The observation deck also gave a nice preview of what we would soon experience. Hanji dolls depict locals working in the green tea fields of Boseong. We headed over to Daehan Dawon tea plantation. We learned that the plantation itself is relatively new. When the Japanese colonized Korea in the 1930s, they found that Boseong had the perfect temperature, humidity, and soil for growing green tea. The Japanese no doubt made a lot of money shipping the leaves back to Japan, but when they were defeated and forced to leave in 1945, tea production at the Daehan Dawon area came to a halt. It wasn't until 1957 that an entrepreneur had the vision to reestablish the plantation. We soon found ourselves on the road leading into the plantation. Lined with gorgeous cedar trees, the road is a sight in itself. We paused for a quick lunch at the cozy restaurant just outside the entrance. It was interesting to see that all of the traditional Korean items on the menu had been given nokcha (green tea) twists. We opted for the nokcha kalguksu (green tea noodle soup) and nokcha donkas (green tea cutlet). Mom and I were both pleased as we headed into the plantation. At first, all we found were various gift shops and cafes, but were suddenly taken aback by the scene that we found a few minutes later. 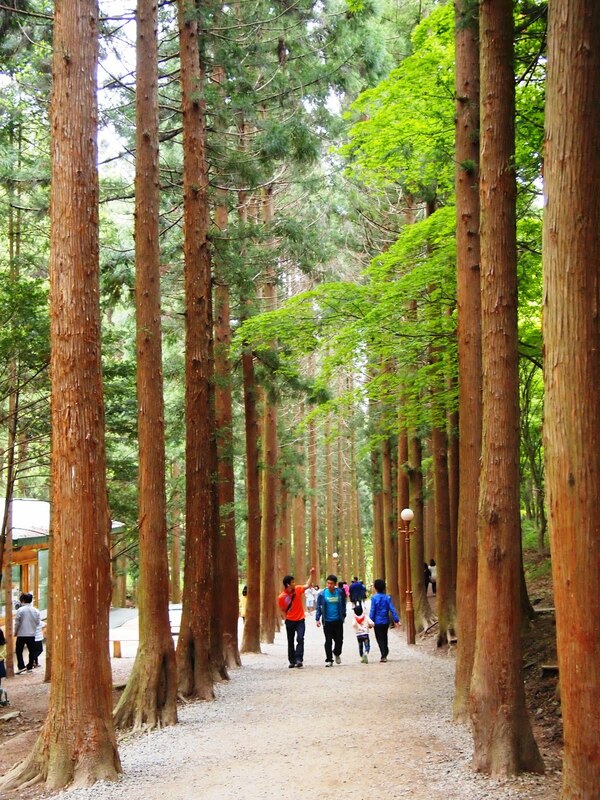 The 'cedar road' that leads into Daehan Dawon is a visual treat. I had seen it in pictures before but nothing could have prepared me for the real thing. 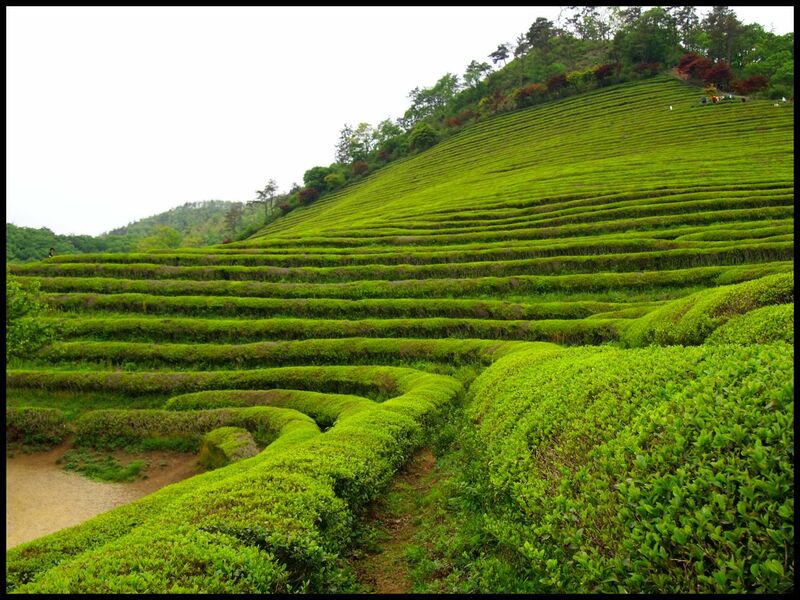 Hills upon hills upon hills of verdant green tea plants rolled out before us. The further we walked, the further and higher they seemed to roll on. It was like looking at a big watercolor landscape. The shades of green were infinite in number and all seemed to layer perfectly upon one another. Time also seemed to slow with each leaf picked by the weathered halmoni (grandmothers), donned in bonnets and thick gloves. It was easy to see they had been working hard over the years but still had a softness to them when they gave my mom and I a smile in passing. 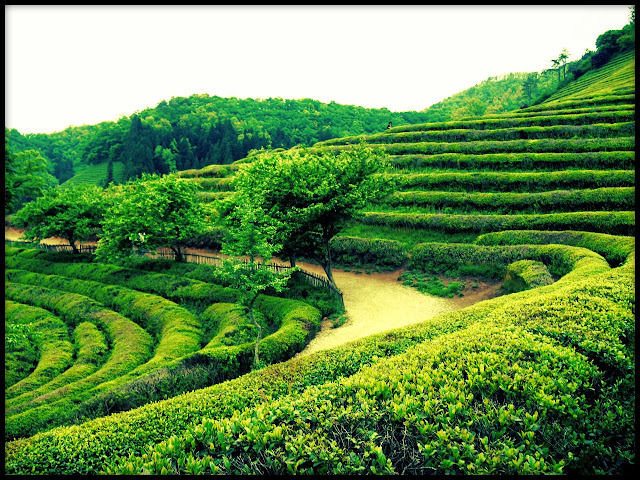 The green tea plants are every shade of green, making the plantation resemble a watercolor landscape. 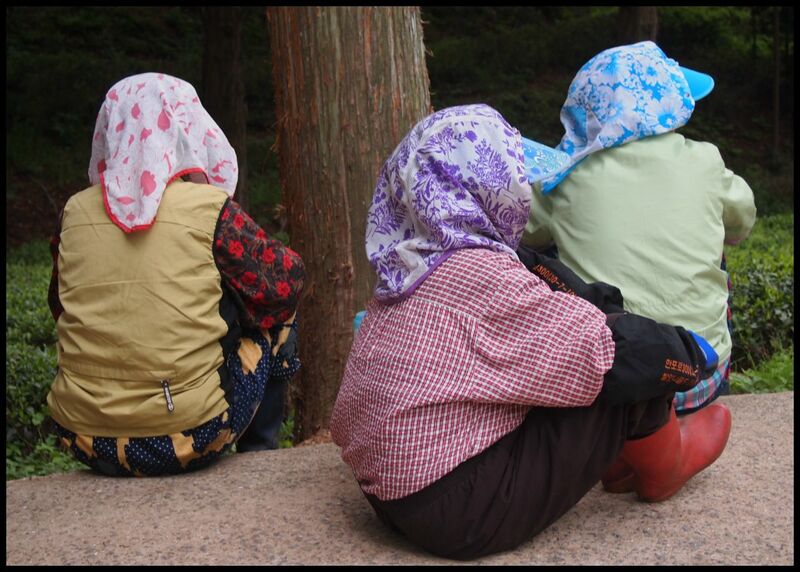 Women take a break after an afternoon picking leaves in the fields. Green is good for the soul. Just before leaving, Mom and I stopped at an on-site cafe and ordered green tea, green tea ice cream, and bought a box of green tea cookies. We plopped down at one of the picnic tables and enjoyed our snacks in the cool air. Hypnotized by the visuals, the light scent of the plants, and the comforting taste of the tea, we left the plantation feeling completely rejuvenated. 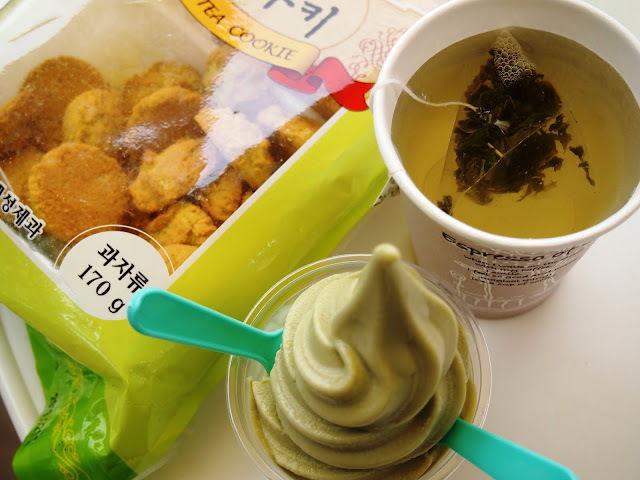 Almost any food product can be turned into a green tea culinary treat. As we headed out to the parking lot, the lack of transportation once again became an issue. Fortunately, a gentleman at the information kiosk generously offered us a ride to our pension. Such kindness can't always be found in the city, so it was a nice thing to experience while out in the country. We spent a final night at the pension and headed back to Seoul the next day. But not before buying a few more boxes of Boseong green tea to get me through the next few months... at least. Wow! This place looks amazing! Thank you for posting! I lived in Korea for a year and actually found it relatively difficult to get good tea at a decent price. I had to go to specialty shops, because the grocery stores had a very limited selection. Not that it was a big problem, I just was expecting tea to be more prevalent like it is in Japan or China; I didn't realize that the Koreans aren't really big tea drinkers. @Tea Drinker, you are right! It seems that these days, Koreans prefer coffee and, as you probably know, cafes can be found just about on every block of the city. The tea that they do drink is usually quite cheap and sometimes serves as a subsitute for water. I expected to find a bigger tea culture here, as well. There are a few places (namely O'Sulloc) that do sell fantastic tea, though it can be a bit pricey. Boseong is a great place to try a nice selection of teas and take in the beauty of the tea fields for an affordable price. Actually green tea is an wonderful remedy for making your health fit & perfect, if you have using ayurvedic its a added taste to drink so that green tea brand also increased in India, Thanks for this wonderful blog. Reading Chinese tea blog can help enriching knowledge about the varieties of tea, and get more taste and better health from every sip.